Escherichia coli single-stranded DNA (ssDNA) binding protein (SSB) is the defining bacterial member of ssDNA binding proteins essential for DNA maintenance. SSB binds ssDNA with a variable footprint of ∼30–70 nucleotides, reflecting partial or full wrapping of ssDNA around a tetramer of SSB. We directly imaged single molecules of SSB-coated ssDNA using total internal reflection fluorescence (TIRF) microscopy and observed intramolecular condensation of nucleoprotein complexes exceeding expectations based on simple wrapping transitions. We further examined this unexpected property by single-molecule force spectroscopy using magnetic tweezers. In conditions favoring complete wrapping, SSB engages in long-range reversible intramolecular interactions resulting in condensation of the SSB-ssDNA complex. RecO and RecOR, which interact with SSB, further condensed the complex. Our data support the idea that RecOR--and possibly other SSB-interacting proteins—function(s) in part to alter long-range, macroscopic interactions between or throughout nucleoprotein complexes by microscopically altering wrapping and bridging distant sites. Chromosomes consist of two strands of DNA that are intertwined as a helix. These strands can peal apart to form single-stranded DNA before the DNA is copied and for other processes in cells. Single-stranded DNA can also form if double-stranded DNA is damaged by harmful radiation or chemicals so that only one strand can be copied or when the damaged strand is selectively degraded by enzymes during the course of repair. Proteins called single-stranded binding proteins (or SSBs for short) bind to single-stranded DNA molecules to protect them. A molecule of single-stranded DNA wraps around a group of four SSB proteins (known as a tetramer). The degree to which DNA is wrapped around the SSB tetramer depends on the environmental conditions. For example, in the presence of high levels of salt—which is typical inside cells – single-stranded DNA wraps around all four subunits of the SSB. However, at lower salt levels, the DNA only wraps around some of the units in the SSB tetramer. A process called recombination can repair breaks in DNA. During this process, a broken DNA molecule that contains single-stranded DNA can pair with a matching (or complementary) strand from an intact double-stranded DNA molecule that carries an identical genetic sequence. A protein called RecO helps to anneal two complementary DNA strands together with the help of the RecR protein. However, for RecR and RecO to achieve this task, they need to work together with the resident SSB proteins that occupy single-stranded DNA. How they find matching sequences when SSB proteins are in the way is not clear. Bell et al. used techniques called TIRF microscopy and single-molecule force spectroscopy to directly observe how SSB from the bacterium E. coli binds to and coats individual molecules of single-stranded DNA. The experiments show that when the levels of salt increase, single-stranded DNA that is coated with SSB proteins becomes compacted and the length of the DNA molecules decreases, a process referred to as ‘intramolecular condensation’. Bell et al. found that condensation occurred because two SSB tetramers that are associated with different regions of the single-stranded DNA interact to form stable ‘octamers’. In the presence of RecO and RecR, the single-stranded DNA compacted even further. Bell et al. propose that these recombination proteins act as a scaffold to bring together distant partner sites of single-stranded DNA. This condensation allows two DNA sequences that can be far apart in the cell to find one another more quickly. The next challenge is to understand how the matching regions of single-stranded DNA are identified, and what causes the SSBs to move to allow other repair proteins to gain access to the DNA. Single-stranded DNA (ssDNA) binding protein (SSB) binds rapidly and avidly to ssDNA generated during the normal processes of DNA replication, recombination, and repair (Meyer and Laine, 1990). In doing so, SSB protects ssDNA from chemical damage and exonucleolytic degradation, removes secondary structure, and enhances the enzymatic activity of many proteins involved in DNA metabolism (Shereda et al., 2008). The extent to which ssDNA is wrapped around a tetramer of SSB is often referred to as a binding mode, defined by the apparent site size or footprint (i.e. nucleotides bound per tetramer). These binding modes are sensitive to salt, temperature, pH, and binding density (Lohman and Ferrari, 1994). The cooperativity, i.e. nearest neighbor interactions, of SSB is also altered when SSB binds ssDNA in different binding modes (Lohman et al., 1986; Bujalowski and Lohman, 1987; Ferrari et al., 1994). At low salt concentrations, where ssDNA is partially wrapped around SSB, cooperativity is very high or ‘unlimited’. As such, proteins crowd very close to each other along the ssDNA. At higher more physiological salt concentrations, SSB binds in the fully wrapped binding mode and exhibits ‘limited’ cooperativity, where SSB forms dimers of tetramers (i.e. octamers) along the ssDNA (Bujalowski and Lohman, 1987; Lohman and Ferrari, 1994). Early electron microscopic visualization of SSB-coated ssDNA revealed a beads-on-string structure similar to those observed for nucleosomes bound to dsDNA (Chrysogelos and Griffith, 1982). These structures are observed at a low binding density of SSB; however, at higher binding densities, the structures form smooth, contoured nucleoprotein complexes that are condensed relative to the contour length of the corresponding dsDNA (Griffith et al., 1984; Hamon et al., 2007). High-resolution atomic force microscopy (AFM) imaging of spread SSB-coated ssDNA formed in low and high salt, measured approximately a twofold difference between the contour lengths of the nucleoprotein complexes. This difference in contour length was proposed to reflect the partially wrapped SSB35 and fully wrapped SSB65 binding modes, corresponding to a site size of 35 and 65 nucleotides, respectively (Hamon et al., 2007). It is worth noting that an additional, intermediate binding mode, SSB55, was also observed in direct binding experiments (Lohman and Overman, 1985; Bujalowski and Lohman, 1986). SSB has been studied extensively using single-molecule FRET on short oligonucleotide substrates (Roy et al., 2007, 2009; Zhou et al., 2011); however, relatively little is known about the more complex dynamics of the SSB-coated ssDNA nucleoprotein fiber that forms on the extensive regions of ssDNA during DNA unwinding, resection, and replication. These ssDNA regions can range from a few hundred to tens of thousands of nucleotides in length. More than a dozen proteins interact directly with SSB via its short, unstructured C-terminal tail (Shereda et al., 2008; Wessel et al., 2013; Bhattacharyya et al., 2014). In the absence of interaction partners or ssDNA, this unstructured peptide tail interacts with the subunits within the SSB tetramer (Kozlov et al., 2010a). This inter-subunit allostery contributes to the complex, cooperative nature of SSB binding to ssDNA. It has been proposed that the binding modes of SSB might be modulated in vivo for differential roles during ssDNA processing. 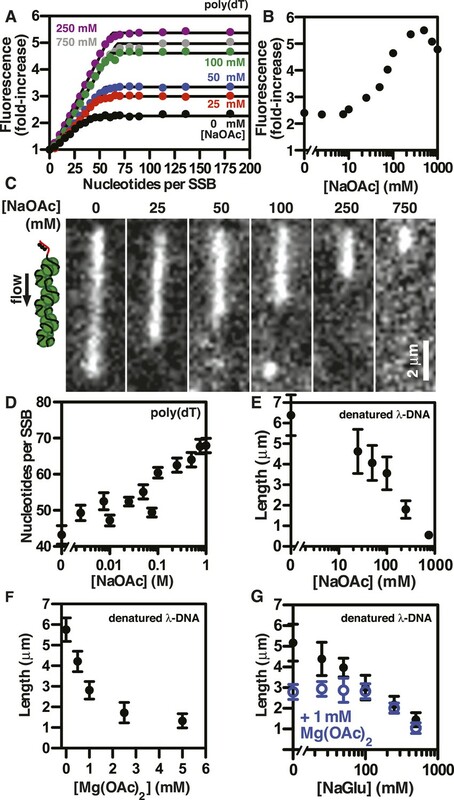 Direct evidence for such modulation remained elusive for many years (Shereda et al., 2008); however, recent work has shown that PriC remodels the SSB-ssDNA complex to create a DNA structure competent for DnaB loading during replication restart (Wessel et al., 2013) and that PriA modulates the SSB-ssDNA complex to expose a potential replication initiation site (Bhattacharyya et al., 2014). RecO catalyzes the annealing of complementary strands of ssDNA even in the presence of SSB, which otherwise kinetically blocks annealing (Kantake et al., 2002); in this regard, perhaps RecO is mimicking the action of PriA (Bhattacharyya et al., 2014). This annealing activity is essential for RecA-independent, homology-directed DNA repair that proceeds through the single-strand annealing (SSA) pathway (Kantake et al., 2002). RecO also stimulates RecA-dependent homologous recombination by acting with RecR and RecF to promote RecA filament assembly (Umezu et al., 1993; Morimatsu and Kowalczykowski, 2003; Handa et al., 2009). RecR, which does not bind to ssDNA, dsDNA, or SSB, binds to RecO and enhances the affinity of RecO for ssDNA-bound SSB (Umezu et al., 1993; Umezu and Kolodner, 1994); however, neither RecO nor RecOR are capable of physically displacing SSB from ssDNA (Umezu and Kolodner, 1994; Ryzhikov et al., 2011). When RecR is bound to RecO, it partially inhibits the annealing activity of RecO but stimulates both the rate of RecA nucleation and filament growth on SSB-coated ssDNA (Kantake et al., 2002; Bell et al., 2012; Morimatsu et al., 2012). As RecA does not interact with SSB, RecO, or RecR (Umezu et al., 1993), this activity must proceed through a RecOR-induced conformational change in the SSB-ssDNA complex (Ryzhikov et al., 2011; Zhou et al., 2011). Using both direct visualization of SSB-coated ssDNA and single-molecule force spectroscopy, we observed the reversible intramolecular condensation of single SSB-coated ssDNA fibers. The extent of this intramolecular condensation increases with salt concentration, but exceeds the expected extent of condensation based on most previous measurements of SSB-ssDNA complexes (Chrysogelos and Griffith, 1982; Hamon et al., 2007). We also observe RecO-induced condensation of the SSB-ssDNA complex, as well as long-range intramolecular bridging in the presence of both RecO and RecR. We propose that the nature of this condensation is due to the ability of SSB to interact with distant sites along the ssDNA—either through dimerization of SSB tetramers or through the partial wrapping of distant ssDNA sites on a single SSB protomer—and that one role of RecOR is to enhance these distant interactions, which in turn would facilitate annealing of complementary strands. Our observations raise the possibility that the microscopic changes in ssDNA-binding modes observed for SSB cause macroscopic condensation (or de-condensation) of the nucleoprotein fiber that, in turn, might regulate access to ssDNA. We previously described a fluorescent biosensor for ssDNA derived from an engineered mutant, SSBG26C, wherein a fluorophore was conjugated to the protein using Alexa Fluor 488 maleimide to produce SSBAF488 (Dillingham et al., 2008). This protein maintains a high, albeit attenuated, affinity for ssDNA (Bell, 2011; Bell et al., 2012). SSBAF488-ssDNA nucleoprotein complexes were formed by first denaturing bacteriophage λ genomic dsDNA that had been biotinylated at the 3′-terminated ends using DNA polymerase (Figure 1A). The denatured DNA was mixed with buffer containing SSBAF488, attached to a glass surface functionalized with streptavidin, extended using flow within a microfluidic chamber, and visualized using total internal reflection fluorescence (TIRF) microscopy (Figure 1B). When the concentration of sodium acetate (NaOAc) was increased during buffer exchange at a constant flow rate and a constant concentration of fluorescent SSB, the length of single molecules of SSBAF488-coated ssDNA shortened (Figure 1C, Video 1, and Figure 1D); however, the fluorescent intensity of individual molecules remained constant (Figure 1E, Video 1, and Figure 1—figure supplement 1), indicating that the protein had not dissociated, but rather redistributed, along the ssDNA molecule. In contrast, when the SSBAF488 was exchanged for unmodified wild type SSB, which has a higher affinity for ssDNA, the fluorescence rapidly decreased as SSBAF488 was displaced from the ssDNA (Figure 1F). Visualization of salt-induced intramolecular condensation of single molecules of SSBAF488-ssDNA complexes. (A) Bacteriophage λ dsDNA (48.5 kbp) was biotinylated, denatured, coated with SSBAF488, and then (B) attached to a streptavidin-coated glass coverslip of a microfluidic chamber where it was extended by buffer flow for direct imaging using total internal reflection fluorescence (TIRF) microscopy. (C) A montage of frames from a video recording the change in length of a single molecule of SSBAF488-coated single-stranded DNA (ssDNA) upon increasing [NaOAc] from 0 to 100 mM. The frames were rendered into a topographical intensity map. Time zero corresponds to the time at which the pump was turned on. The dead time of the experiment was ∼25 s due to the liquid volume in the lines between the syringe valve and the microfluidic chamber. (D) The length of the molecule in panel C during the change in salt from 0 mM to 100 mM NaOAc was measured for each frame and is plotted as a function of time. The dotted line represents the injection of the buffer into the microfluidic flow chamber. (E) The fluorescence intensity of the molecule in panel C was also measured for each frame and is plotted as a function of time. (F) The fluorescence intensity of a single molecule of SSBAF488-coated ssDNA is plotted as function of time during a similar experiment where SSBAF488 was exchanged for wild-type, unlabeled SSB. The decrease in fluorescence intensity corresponds to the displacement by wild-type SSB, which has higher affinity for ssDNA than SSBAF488. The fluorescence intensity (green circles) was determined by the mean pixel intensity of region of interest (ROI), and the gray error bars are the standard deviation of the pixels within the ROI. Salt-induced intramolecular condensation of SSBAF488-ssDNA. High resolution imaging of SSB-coated ssDNA, using electron microscopy (EM) and AFM, had previously observed that the length of the nucleoprotein fiber is dependent on the buffer condition in which the complex is formed (Chrysogelos and Griffith, 1982; Hamon et al., 2007). However, we were perplexed by the observation that the amount of protein—indicated by the total fluorescent intensity—along the ssDNA remained essentially unchanged during each salt-jump transition, despite the fact that the length had changed substantially. Stopped-flow kinetic studies have previously demonstrated that SSB tetramers can transfer between ssDNA molecules without proceeding through a free protein intermediate (Kozlov and Lohman, 2002a, b) and single-molecule experiments have directly demonstrated that SSB tetramers diffuse rapidly on ssDNA and can ‘hop or jump’ across long distances of ssDNA via intersegmental transfer (Roy et al., 2009; Zhou et al., 2011; Lee et al., 2014). To distinguish between the intramolecular redistribution of SSB along the ssDNA in cis vs dissociation balanced with rebinding during the transition, we asked whether the salt-induced condensation of single molecules might be reversible in the absence of free protein. To address this possibility, SSB-coated ssDNA was tethered in a flow cell and extensively washed with buffer to remove free protein (∼100–200 volumes of the flow chamber). An injection loop was then used to transiently pulse the tethered molecules with buffer containing either 100 or 400 mM NaOAc, followed by a sufficient volume of buffer to remove the injected salt. When the salt concentration was raised to 100 mM NaOAc, the flow-extended molecules compacted to ∼60% of the length in the absence of salt (Figure 2A, Video 2), and then returned to the previously extended length when the salt was removed from the flow chamber. Similarly, this condensation was also observed when 400 mM NaOAc was used (Figure 2B, Video 3); however, the extent of the condensation was greater, wherein the molecules shortened to ∼12% of the flow-extended length in the absence of salt. In both experiments, the molecules were dimmer at the end of the experiment (Figure 2—figure supplement 1), where approximately 20% of the SSB dissociated in the 0→100 transition, and ∼60% dissociated in the 0→400 transition. The length change upon salt-induced condensation of SSBAF488-coated ssDNA is nearly reversible in the absence of free SSB protein. (A) A montage of frames from a video recording of a single molecule of SSBAF488-coated ssDNA contracting in length as the salt concentration is increased from 0 to 100 mM NaOAc, and then subsequently reduced back to zero, conducted in the absence of free SSBAF488. The flow cell was extensively washed with buffer to remove free SSB protein from the flow cell before beginning the experiment. Video recording began when the pump was turned on, requiring ∼40-50 s for the dead volume to be flushed from the lines to the flow chamber. (B) Same as in (A), except the salt concentration was increased from 0 mM NaOAc to 400 mM NaOAc and then back to zero. Each frame of the montages is one micron wide. SSBAF488 was omitted from both of the high salt washes and from the 0 mM wash. Flow is from top to bottom in each image. Condensation of SSBAF488 in the absence of free protein during a transient increase from 0 to 100 mM NaOAc. Video recording of a single molecule of SSBAF488-coated ssDNA contracting in length as the salt concentration is increased from 0 to 100 mM NaOAc, and then subsequently reduced back to zero mM, conducted in the absence of free SSBAF488. The flow cell was extensively washed with buffer to remove free SSB protein before beginning the experiment. Video recording began when the pump was turned on, requiring ∼40-50 s for the dead volume to be flushed from the lines to the flow chamber. SSBAF488 was omitted from both of the high-salt washes and from the 0 mM wash. The video corresponds to the molecule presented in Figure 2A and Figure 2—figure supplement 1, panels B, C.
Condensation of SSBAF488 in the absence of free protein during a transient increase from 0 to 400 mM NaOAc. Video recording of a single molecule of SSBAF488-coated ssDNA contracting in length as the salt concentration is increased from 0 to 400 mM NaOAc, and then subsequently reduced back to zero mM, conducted in the absence of free SSBAF488. The flow cell was extensively washed with buffer to remove free SSB protein before beginning the experiment. Video recording began when the pump was turned on, requiring ∼40-50 s for the dead volume to be flushed from the lines to the flow chamber. SSBAF488 was omitted from both of the high-salt washes and from the 0 mM wash. The video corresponds to the molecule presented in Figure 2B and Figure 2—figure supplement 1, panels D, E.
SSBAF488 is particularly suitable for single molecule measurements due to its relative photostability, whereas an alternative biosensor derived from fluorescein-5-maleimide, SSBf, is particularly suitable as an ensemble ssDNA-biosensor due to the large, linear increase in fluorescence upon ssDNA binding (Dillingham et al., 2008; Bell, 2011). To determine whether the measured lengths of individual SSBf-coated ssDNA complexes were correlated with the DNA-binding modes of SSB, we measured the stoichiometry of SSBf binding to poly(dT) using ensemble fluorescence measurements. Poly(dT) was titrated into a fixed concentration of SSBf at various concentrations of NaOAc, and the data were fit to a two-segment line to determine the apparent site size, which reflects the extant binding mode at each salt concentration (Figure 3A). The observed site size increased from ∼43 to ∼70 nucleotides per SSB tetramer over the range of salt concentrations tested as expected; however, we noted that the amplitude of the fluorescence enhancement increased dramatically with salt concentration, indicating the molecular environment of the fluorophore was altered (Figure 3B). In addition to the stoichiometric titrations performed by adding ssDNA to a fixed concentration of SSBf, we performed so-called ‘salt back-titrations’ to determine the concentration at which SSBf dissociates from ssDNA. When pre-formed complexes of SSBf-poly(dT) were titrated with an increasing concentration of salt (Figure 3—figure supplement 1), we observed an initial sharp increase in the fluorescence corresponding to the amplitudes from our direct titrations shown in Figure 3A. 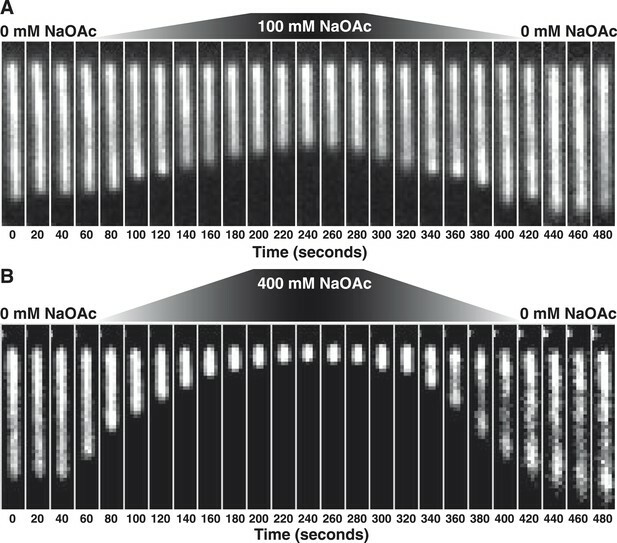 The fluorescence peaked between 200 and 400 mM NaOAc, and was followed by a shallow, linear decrease until the concentration reaches approximately 2M NaOAc, where the fluorescence intensity exhibited a sharp decrease due to dissociation (Figure 3—figure supplement 1). The midpoint of this sharp transition corresponds to the so-called, ‘salt-titration midpoint’, where ∼50% of the complex is dissociated (Kowalczykowski et al., 1981; Newport et al., 1981). The salt-titration midpoint for this experiment shows that ∼2 M NaOAc in the presence of 5 mM Mg(OAc)2 is required to dissociate half of the protein from the DNA. The extent of SSB-ssDNA condensation is greater than anticipated based on known ssDNA-wrapping transitions. (A) Poly(dT) was titrated into 100 nM SSBf (tetramer) and the average fluorescence enhancement of SSBf from three titrations was plotted as a function of ratio of poly(dT) to SSB tetramer. The data were fit to a two-segment line, where the breakpoint is the stoichiometric endpoint of the titration corresponding to the site size of SSBf. (B) The amplitude of the fluorescence enhancement from the titrations performed in Figure 3A was plotted as a function of [NaOAc]. The error is smaller than the symbols. A larger number of titrations are shown here than in panel A to prevent panel A from being overcrowded; each fold-increase was determined by a full stoichiometric titration where each titration was completely and fully saturated. (C) Representative images of single molecules of SSBf-coated ssDNA at increasing [NaOAc] indicated. (D) The apparent binding site size (black circles, ± error of the fits from panel A determined from the titrations performed in panel A were plotted as a function of salt concentration. (E) Length of SSBf-coated ssDNA molecules plotted as a function [NaOAc] (N = 213). (F) Length of SSBf-coated ssDNA plotted as a function of [Mg(OAc)2] (N = 156) and (G) as a function of [NaGlu] in the absence (black, closed circles, N = 205) and presence (blue, open circles, N = 214) of 1 mM Mg(OAc)2. Unless otherwise indicated, all error bars represent standard deviation and when not visible were smaller than the symbols. 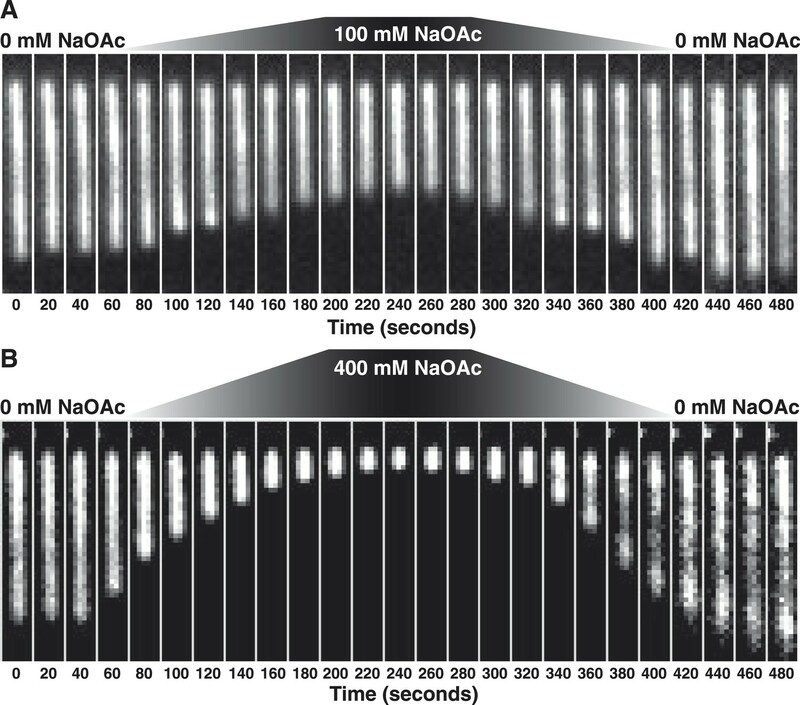 Individual SSBf-ssDNA complexes were also visualized with TIRF microscopy at increasing concentration of NaOAc, and it was evident that the length of the nucleoprotein fibers decreased as the NaOAc concentration increased (Figure 3C). Because we initially considered that the change in length might simply correspond to the change in the salt-dependent binding mode, we plotted the apparent site size determined from the titrations shown in Figure 3A, as a function of increasing [NaAOc] (Figure 3D) and compared this to the average length of SSBf-ssDNA complexes (Figure 3E), measured from images such as those in Figure 3C and more thoroughly represented in Figure 3—figure supplement 2. This comparison shows that the site size changes approximately ∼1.7-fold (43 nts to 70 nts) over this range whereas the length of the SSB-ssDNA molecules changes approximately ∼13-fold (from ∼6.5 μm to ∼0.5 μm). We note that the apparent site size of SSB can vary depending on the ssDNA used owing to exclusion of SSB from regions capable of forming stable secondary structure (Lohman and Overman, 1985); however, the reported change in site size for natural M13 ssDNA is only ∼2.2-fold (from 35 to 77) over a comparable range (1 mM to 300 mM NaCl), which is insufficient to account for our observations. If SSBf dissociated from ssDNA during the salt transitions, then formation of secondary structure could explain the additional compaction; however, when we measured the intensity of individual SSBf-ssDNA fibers at each salt concentration (Figure 3—figure supplement 3), we see an increase in fluorescence intensity similar to––and in good agreement with––the titration performed with poly(dT) in Figure 3A,B, and Figure 3—figure supplement 1. We note that the increase in fluorescence observed in Figure 3—figure supplement 3 is due to the environmental sensitivity of SSBf, and should not be confused with the results from Figure 1, where we used SSBAF488. Owing to the complex changes in fluorescence upon ssDNA binding, we cannot completely rule out the possibility that protein partially dissociates from the SSBf-ssDNA; however, we see no evidence of significant net dissociation in our assay in the presence of free protein. In the absence of free protein in solution, dissociation is apparent during the salt transitions (Figure 2—figure supplement 1), indicating that the net constant intensity we observe in Figure 1 and Figure 1—figure supplement 1 is maintained by mass action and rapid re-binding and redistribution of SSB along the ssDNA polymer. To further assess the condensation state of SSB-coated ssDNA at approximately physiological ionic conditions, we measured the SSBf-ssDNA lengths in the presence of the divalent cation magnesium, which is known to affect SSB binding modes (Bujalowski et al., 1988). Mg(OAc)2 induces a large condensation of nucleoprotein fibers that plateaus between 1 and 2 mM, and results in complexes that are as short as those produced with the much higher monovalent salt concentrations (Figure 3F and Figure 3—figure supplement 4). Escherichia coli maintains its intracellular osmolality by adjusting the intracellular concentration of glutamate, which ranges from ∼30 to 260 mM when cells are grown in media containing from ∼100 to 1100 mM solute (Richey et al., 1987). Therefore, we also titrated sodium glutamate (NaGlu) in the presence and absence of 1 mM Mg(OAc)2, which is within the range of the measured intracellular free magnesium ion concentration (1–2 mM) (Alatossava et al., 1985). At low concentrations of NaGlu (i.e. below 100 mM), the condensation was dominated by the presence of 1 mM Mg(OAc)2; however, the observed condensation became dominated by NaGlu at higher concentrations (Figure 3G and Figure 3—figure supplement 5 and 6). In the absence of Mg(OAc)2, there was a log-linear decrease in length with increasing concentrations of NaGlu, similar to our observation for NaOAc. Extrapolating from this data, the shorter, more condensed molecules that we observe likely represent the physiologically relevant condensation state of the SSB-ssDNA complex as estimated by the in vivo concentration and composition of salts. To further explore the intramolecular condensation of SSB-coated ssDNA, we used a magnetic tweezer instrument to generate force-extension curves (Gosse and Croquette, 2002; Meglio et al., 2009). In particular, we reasoned that force spectroscopy would enable us to distinguish between intramolecular collapse owing to secondary structure formation and exclusion of SSB versus intrinsic, protein-mediated folding of the SSB-ssDNA molecule. We further reasoned that because SSBf is a modified variant of SSB (Dillingham et al., 2008; Bell, 2011), we could not exclude the possibility that a component of the intramolecular condensation might be due to the fluorescent adduct. This concern prompted us to assess the condensation state of single molecules of ssDNA coated with wild-type, unmodified SSB. Briefly, a ∼13.5-kbp DNA substrate with unique flanking restriction sites was PCR amplified from bacteriophage λ DNA. Molecular ‘handles’ were made by PCR amplification of two fragments (∼2 kbp each) using pUC19 as a substrate in the presence of modified nucleotides. One fragment was amplified in the presence of DIG-dUTP, while the other was amplified in the presence of biotin-dGTP. These PCR fragments were ligated to the ends of the 13.5 kbp substrate (Figure 4A, leftmost cartoon). The DNA substrate was alkali denatured and then neutralized with buffer (Figure 4A, center cartoon). This resulted in ssDNA with one end that could be attached to the glass surface of a microfluidic cell that had been functionalized with anti-DIG antibodies, and the other end could be attached to a streptavidin-coated paramagnetic bead (Figure 4A, rightmost cartoon). Paramagnetic beads and ssDNA that were not attached to the surface were flushed from the flow cell. Force-extension measurements of individual molecules were performed first in the absence of SSB at increasing salt concentrations. The salt was flushed from the flow cell, and measurements were then repeated in the presence of SSB, again at increasing concentrations of salt. (A) A DNA substrate was made by ligating biotin- and DIG-containing ‘handles’ (i.e. ∼2-kb products from PCR containing biotin-dGTP or DIG-dUTP) to the flanking ends of a 13.5-kb DNA substrate. The ligated product was then alkali denatured, attached to magnetic streptavidin-coated beads, and then tethered to a glass surface coated with anti-DIG antibodies within a flow chamber. When present, SSB was added to the flow chamber and bound to the ssDNA in situ. (B) A typical time trace of a single molecule of SSB-coated ssDNA during a force-extension experiment. The length was determined at each force applied after the molecule had reached equilibrium (inset). (C) The force-extension and relaxation relationship of a single ssDNA molecule is shown in the absence of SSB at increasing concentrations of NaOAc. The plot shows length measurements made while both decreasing (dashed lines) and increasing force (solid). (D) The force-extension relationship of ssDNA in the presence of 200 nM SSB at increasing concentrations of NaOAc. (E) The relative condensation (L/L0, where L0 is the length of SSB-coated ssDNA in the absence of salt) of the molecules measured in panel D were plotted as a function of salt concentration for each applied force and compared to the relative condensation of molecules measured in direct visualization (TIRF) experiments from Figure 3C,E. The extension of the ssDNA was measured by incrementally increasing and then decreasing the distance between the magnet and the surface, thereby decreasing and increasing the force, respectively. When SSB was bound to the ssDNA, both increasing and decreasing the force kinetically perturbed the length of the SSB-ssDNA complex with apparent exponential kinetics (Figure 4B, inset). Care was taken to insure that the length measurements were made only after the ssDNA or SSB-ssDNA complex was in equilibrium at each force (Figure 4B). Force-extension curves of individual molecules of ssDNA were obtained by first decreasing force (dashed lines) and then increasing force (solid lines) at increasing concentrations of NaOAc in the absence (Figure 4C) and presence of SSB (Figure 4D and Figure 4—figure supplement 1). The force-extension curves of ssDNA alone show that the force required to stretch ssDNA also increases with respect to increasing concentrations of NaOAc (Figure 4C). The force-extension curves for ssDNA alone at salt concentrations greater than 25 mM NaOAc demonstrate hysteresis (i.e. the force-extension curves obtained by increasing and decreasing force do not overlap) due to the formation of secondary structure in the ssDNA (Bosco et al., 2014) see also, (Zhang et al., 2001; Saleh et al., 2009). Interestingly, this hysteresis was absent in the force-extension curves measured in the presence of SSB (Figure 4D), except at 750 mM NaOAc, the highest salt concentration that we used in our magnetic tweezer experiments. This modest hysteresis at the highest concentration of NaOAc is consistent with our interpretation that the decrease in the amplitude of the fluorescence enhancement measured during equilibrium titrations with SSBf is due to partial dissociation of SSB at concentrations of NaOAc greater than 750 mM (Figure 3A,B). More importantly, the absence of hysteresis in the presence of SSB is strong evidence that the structures are always at equilibrium, and that there are no kinetically trapped intermediates, neither short range nor the more likely long range random interactions (Schaper et al., 1991), that would contribute to non-equilibrium behavior. We therefore infer that the intramolecular condensation that we observe is intrinsic to a reversible equilibrium folding of the SSB-ssDNA complex. The length of SSB-coated ssDNA from Figure 4D was normalized to that in the absence of salt in order to determine the relative salt-induced condensation at each force measurement. This relative condensation was calculated by dividing the length, L, by L0 (i.e. L/L0), where L0 is the length of the SSB-coated ssDNA in the absence of salt (0 mM NaOAc) for each applied force. The relative condensation was then re-plotted as a function of increasing NaOAc concentration for each force measurement (Figure 4E). As the concentration of NaOAc increases, the length of the SSB-coated ssDNA monotonically decreases, or condenses, (Figure 4E); however, the extent of the condensation is dependent on the force applied. We also compared the salt-dependent length changes measured using magnetic tweezers (Figure 4D,E) to the salt-dependent length changes observed in the direct visualization experiments using TIRF microscopy (Figure 3C,E) by calculating the relative condensation, L/L0, to permit a normalized comparison of the different lengths of ssDNA used in each experiment. Since the salt-induced condensation of the molecules measured in the TIRF experiments (Figure 4E, black squares) is most similar to the relative condensation observed in the magnetic tweezer experiments that were performed at forces between 0.1 and 0.5 pN (Figure 4E, orange and gray circles), we estimate that this is approximately the shear force applied by flow during TIRF microscopy within our microfluidic cells. Importantly, because the salt-induced condensation of the SSBf-ssDNA complex is in qualitative agreement with the data obtained with wild-type SSB, we conclude that the salt-induced condensation observed in Figure 3 and Figure 4D,E is dominated by intramolecular bridging in cis, mediated by oligomers of SSB, rather than any property of the modified SSBf (see Discussion). Force spectroscopy directly measures the work required to extend a molecule, and thus can be used determine the energetic consequences of protein binding to DNA (Liphardt et al., 2002). The integrated area under a force-extension curve is the work performed on––or absorbed by––the polymer that is being stretched (Figure 5). We therefore integrated the area under the force-extension curves, relative to the area for ssDNA alone in the absence of salt, to measure the change in energy of the interrogated molecule due to the presence of salt (Figure 5—figure supplement 1A) and/or SSB (Figure 5—figure supplement 1B). The measured change in energy (ΔE), in units of pN•nm, was then converted to units of kBT (i.e. the Boltzmann constant multiplied by the absolute temperature) using the relationship kBT ∼ 4.1 pN•nm at 25°C, which corresponds to the energy contribution from thermal fluctuations (Nelson, 2004). The energy of salt-induced stabilization of ssDNA secondary structure is apparent in the deviation between the results obtained for pulling (Figure 5A, increasing force, black filled circles) and relaxing (Figure 5A, decreasing force, open circles) ssDNA in the absence of SSB. In the presence of SSB, the change in energy with respect to salt concentration approximately paralleled the behavior of ssDNA being relaxed from high force to low (Figure 5A, compare red circles, red line with open black circles, dashed line), where long range ssDNA secondary structure does not contribute energetically. Because there was no hysteresis for SSB-ssDNA complexes (Figure 4D), the parallel energetic behavior of SSB-ssDNA and relaxing ssDNA suggests that SSB eliminates the hysteresis seen in ssDNA alone that is introduced by secondary structure formation (Zhang et al., 2001) and SSB allows the ssDNA within the complex to behave as though long range secondary structure were absent. The addition of SSB resulted in an additional 3100 (±550) kBT (represented as ΔΔE) at salt concentrations from 25 to 250 mM NaOAc relative to relaxing ssDNA (Figure 5—figure supplement 2, open red circles, dashed line). Only at the highest salt concentration that we measured, 750 mM NaOAc, did we measure a substantial reduction in the ΔΔE, consistent with our interpretation that SSB dissociates at these high salt concentrations, but not measurably below 250 mM NaOAc. While the total energy contribution of SSB binding is nearly constant (i.e. isoenergetic) within error, with respect to increasing salt concentrations (up to ∼250 mM NaOAc), the contribution of each individual SSB tetramer should (and does) vary due to the transition in the site size across the range of salt conditions. This is––in part––reflected in the complex relationship that increasing salt has on the intrinsic flexibility of the ssDNA (reflected in the ‘relaxing’ curve, Figure 5A, open black circles) vs the folding contributions of secondary structure (reflected in the ‘pulling’ curve, Figure 5A, closed black circles). Because SSB eliminates hysteresis, and we interpret this as complete removal of hysteretic secondary structure, we reason that the relevant comparison (i.e. ΔΔE calculation) is between the +SSB curve (Figure 5, red symbols) and ‘relaxing’ ssDNA (Figure 5, open black symbols) (see Discussion). Accounting for the change in site size as the concentration of salt increases, the energy of SSB binding to ssDNA in our measurement corresponds to ∼11 (±2) kBT per SSB tetramer (assuming ∼200–320 SSB tetramers per ssDNA molecule), which is in reasonable agreement with the binding energy previously reported (Zhou et al., 2011; Suksombat et al., 2015). These calculations are limited owing to our inability to actually count the number of SSB tetramers bound to each ssDNA molecule in the magnetic tweezer experiment. (A) The work (i.e. ΔE) stored in the ssDNA or SSB-coated ssDNA molecules was determined from the area under the curves from the data in Figure 4C,D, as shown in Figures 5—figure supplements 1, 2, and plotted as a function of the natural logarithm (bottom x-axis) of NaOAc concentration (top x-axis) for ssDNA (black-filled circles, increasing force; black open circles, decreasing force) and for SSB-coated ssDNA (red filled circles). The lines are linear fits where the slope, δkBT/δln[NaOAc], is 1000 (±200) for SSB (red line), 1500 (±200) for ssDNA when decreasing force (black dashed line), and 2200 (±150) for ssDNA when increasing force (black solid line). (B) The force–extension relationship of a single molecule of ssDNA was measured in the absence of salt (black), then again after sequentially adding each of the following: 100 mM NaOAc and 1 mM Mg(OAc)2 (red), 200 nM SSB (blue), 100 nM RecO (purple), and 1 μM RecR (green). The extension in the presence of RecO results in approximately a 10% condensation at each force measured. In the presence of both RecO and RecR, significant hysteresis is observed (compare solid and dashed green lines). (C) The change in energy was determined by integrating the area under the curves in panel B relative to the ssDNA alone curve (black), and are plotted for both increasing (filled bars) and decreasing force (open bars). (D) A cartoon depicting our model for salt-induced intramolecular bridging mediated in cis by oligomers of SSB (either tetramers or octamers). RecOR may mediate bridging either in cis, along the same molecule of SSB-coated ssDNA, or in trans to promote annealing of complementary ssDNA. We next asked whether the intramolecular condensation could also be induced by addition of a protein that interacts with SSB and that is presumed to alter its interactions with ssDNA. Therefore, single-molecule force spectroscopy experiments were also performed in the presence of RecO, with and without RecR (Figure 5B). For naked ssDNA, in the absence of NaOAc and Mg(OAc)2, the force-extension curves overlap when the applied force is either increased or decreased (i.e. there is no hysteresis) (Figure 5B, black curves); however, when 100 mM NaOAc and 1 mM Mg(OAc)2 were added to mimic physiological conditions, significant hysteresis was observed (red curve, Figure 5B) due to the salt-induced stabilization of DNA secondary structure (Smith et al., 1996). As documented above, this hysteresis in the presence of 100 mM NaOAc and 1 mM Mg(OAc)2 was also completely eliminated upon the addition of SSB (blue curve, Figure 5B). When RecO was added in a stoichiometric ratio to SSB, the nucleoprotein fiber shortened ∼10% relative to SSB-alone across the entire force spectrum, and hysteresis was not evident (purple lines, Figure 5B). The absence of hysteresis in the presence of RecO is interesting because RecO is known to facilitate annealing of complementary ssDNA in the presence of SSB (Kantake et al., 2002), suggesting that RecO functions primarily in trans to promote annealing of complimentary strands, but not in cis to permit formation of non-specific secondary structures. RecR forms oligomers (dimers/tetramers) (Kim et al., 2012) and interacts with RecO (Umezu and Kolodner, 1994), but does not interact with SSB, ssDNA or dsDNA (Radzimanowski et al., 2013). It also negatively regulates RecO-dependent annealing (Kantake et al., 2002) but promotes SSB-ssDNA remodeling in such a way that enhances both the nucleation and growth of RecA filaments on SSB-ssDNA (Bell et al., 2012). When we added RecR in the presence of both SSB and RecO, we observed severe hysteresis in the force-extension curves (Figure 5B, compare solid and dashed green lines). When the force was decreasing (Figure 5B, green dashed line), the curve was essentially indistinguishable from the experiment containing RecO and SSB (Figure 5B, purple lines), but when the force was increasing, significantly more force was required to extend the molecule (Figure 5B, green solid line). This hysteresis suggests that RecR bridges distant contacts, either through protein–protein interactions or by facilitating intramolecular annealing in cis of regions of micro-homology, and that these contacts are disrupted as the fiber is stretched by the magnetic tweezers. Similar to the analysis that we showed in Figure 5—figure supplement 1 and Figure 5A, in Figure 5C we show the integrated area under the force extension curves to determine the change in energy due to the successive and additive inclusion of buffer containing salt (100 mM NaOAc and 1 mM Mg(OAc)2 (red); SSB (blue); RecO (purple); and RecOR (green). The bars in the plot represent the work (expressed as Δ Energy) done while increasing force (i.e. pulling; filled bars) or decreasing force (i.e. relaxing; open bars) during the experiment. As expected from our previous experiments, the addition of salt induced hysteresis in the force-extension curve, wherein formation of intramolecular secondary structure accounted for approximately 1400 kBT. The addition of SSB was sufficient to eliminate this hysteresis in the presence or absence of RecO. The energy contribution of RecO to the SSB-ssDNA energy was modest, accounting for ∼250 kBT (or ∼1.2 kBT per SSB tetramer). The addition of RecR––so that SSB, RecO, and RecR were all present––again, contributed a modest amount of energy when the complex was relaxing (an additional ∼220 kBT or ∼1 kBT per SSB tetramer); however, when RecOR was bound to the SSB-coated ssDNA, hysteresis returned to the system, which we interpret as a result of long-range, protein–protein interactions bridged by RecOR bound to SSB-ssDNA. The energy contribution from RecOR-mediated bridging was ∼2000 kBT (or ∼10 kBT per SSB tetramer). Interestingly, this energy contribution is essentially the same as the energetic contribution from SSB binding to ssDNA alone (∼9–13 kBT per tetramer, see previous section), indicating that RecOR bridges distant SSB tetramers and those tetramers must be disrupted as the molecule is stretched by increasing force. We conclude that when incubated together, RecOR forms a complex that binds to SSB-bound to ssDNA, and in doing so, both modulates the wrapped-state, or binding-mode, of SSB in order to induce macroscopic changes and serves as a scaffold to bridge distant sites along the SSB-ssDNA nucleoprotein fiber. In this work, we comparatively analyzed how the length of SSB-coated ssDNA is modulated by salt and protein binding partners, correlating measurements of ensemble equilibrium binding, direct visualization of single molecules, and single-molecule force spectroscopy. 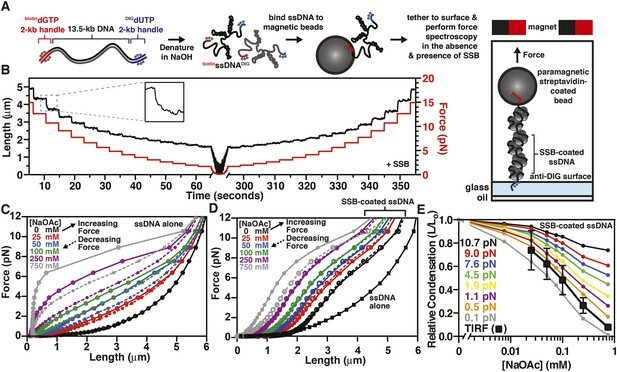 These results provide an extensive physical description of the polymer dynamics of SSB-coated ssDNA and reveal a previously unrealized property of SSB-ssDNA complexes to interact with distant intramolecular sites, which is manifest as condensation of single nucleoprotein fibers. This macroscopic condensation could occur either through the association of stable octamers or through ssDNA by the direct binding of distant sites to a single tetramer. The extent of condensation, however, is greatest under conditions where ssDNA is fully wrapped around the protein in the SSB65 binding mode, making the former possibility more likely. In our force-spectroscopy experiments, the addition of SSB (or SSB and RecO) eliminated the salt-induced hysteresis caused by formation of DNA secondary structure through intramolecular annealing in cis. When we compare the energetic contribution of SSB binding to ssDNA, relative to the salt-induced effects on the ssDNA polymer energetics (excluding the contributions from long range secondary structure by comparing the ‘relaxing’ ssDNA force-extension curves), the change in energy due to SSB binding (when summed over a single molecule of ssDNA) is nearly isoenergetic across a large salt concentration range (Figure 5A, compare the slope for SSB, red-filled circles, to relaxing ssDNA alone, open black circles, and Figure 5—figure supplement 2). This is both interesting and unexpected as it implies a homeostasis with regard to the energetics of SSB, relative to ssDNA, at physiological salt concentrations, making the absolute intracellular salt concentration nearly unimportant relative to other cellular processes working on or with the SSB-ssDNA complex. We propose that this relatively constant energy contribution across the ssDNA is made possible by a net change in the microscopic binding modes of SSB in such a way that all (or most) ssDNA is effectively coated by SSB, albeit with each SSB tetramer engaged in a different number of nucleotides and a different number of SSB tetramers engaged at each salt concentration. In this way, the sum of the energy changes (see Suksombat et al., 2015) for each tetramer is balanced across a wide range of physiological conditions. Importantly, this ‘isoenergetic landscape’ is independent of salt only when we compare the SSB-ssDNA curves with the relaxing conditions for ssDNA alone (Figure 5A and Figure 5—figure supplement 2), where secondary structure considerations are experimentally removed. From the perspective of displacing SSB from ssDNA by another protein, this is the biologically relevant comparison because the absence of hysteresis in the SSB-ssDNA curves shows that there is no long range secondary structure in the SSB-ssDNA complexes. When we calculate the ΔΔE relative to the ‘pulling’ condition with ssDNA alone where the contributions of secondary structure are clearly evident (Figure 5A, solid black circles and Figure 5—figure supplement 2, solid red circles, solid red line), the ΔΔE decreases until it becomes negative (and therefore unfavorable) at approximately 400 mM NaOAc, corresponding to a concentration of salt where secondary structure may become more stable than the SSB–ssDNA interaction (consistent with our observations in Figure 1—figure supplement 1). Therefore, this net energetic accounting reflects what would be apparent in a traditional ensemble measurement, where SSB-binding and DNA secondary structure formation are in competitive equilibrium, and reconciles our observations with previous work that has interrogated the salt-dependence of SSB-ssDNA interactions where the standard state for free energy calculations is the free ssDNA that will form secondary structure. Previous AFM imaging of SSB bound to M13mp7 ssDNA (7249 nts) measured contour lengths of SSB-ssDNA of ∼920 nm in the low salt, 35-nucleotide binding mode, and 560 nm in the high salt, 65-nucleotide binding mode; this change represents a 1.6-fold increase upon going from high to low salt, or a decrease of 60% upon going from low to high salt (Hamon et al., 2007). Since denatured λ-phage DNA is 6.6-fold longer than M13mp7 ssDNA, we expected our SSB-ssDNA would be approximately 6.1 μm long in low salt and compacted by 1.6-fold to approximately 3.7 μm long in high salt (up to ∼300 mM Na+); however, we observed an approximately fourfold compaction over this range. A substantially greater degree of compaction of the complexes was measured upon further increase in salt concentration – from 6.5 μm in the absence of salt to 0.5 μm at 750 mM NaOAc – which is a 13-fold compaction. If the site size was the dominant factor determining the condensation state of SSB-coated ssDNA, then the maximum change in length should be approximately twofold, yet we measure a ∼13-fold decrease in length. We propose that an explanation derives from the fact that SSB does not simply bind to ssDNA as an array of globular units, but instead exhibits limited cooperativity between tetramers, at higher salt concentrations, where it also forms octamers (Lohman and Bujalowski, 1988; Bujalowski and Lohman, 1989a, b) which might serve as an intramolecular bridges between distant sites along the ssDNA resulting in the condensation that we observe (Chrysogelos and Griffith, 1982; Griffith et al., 1984; Hamon et al., 2007). Although the molecular nature of the condensing species is unknown, we also note that the population of the various SSB-binding modes depends not only on intracellular solution conditions, but also on the SSB concentration itself due to the established effects of ‘competition’ between DNA-binding modes with different site sizes, affinities, and cooperativities (Schwarz and Stankowski, 1979; Bujalowski et al., 1988); therefore, with SSB in excess over ssDNA – which is the cellular situation – multiple modes coexist and may serve to keep the amounts of bound SSB nearly constant. Finally, although the high degree of salt-induced compaction of SSB-ssDNA that we observed was surprising based on previous AFM and EM studies, our results are in good qualitative agreement with early, largely unexplained, ultracentrifugation experiments performed with SSB-saturated M13-phage ssDNA (Schaper et al., 1991): our changes in length with salt concentration map exactly on the reported changes in sedimentation coefficients for the SSB-M13 ssDNA complexes. Importantly, the force-extension measurements of unlabeled, wild-type SSB recapitulates the relative condensation of SSBf-coated ssDNA observed in the direct visualization experiments, indicating that the observed condensation of the fluorescently modified nucleoprotein complex in Figure 1C and Figure 3C–G is not a consequence of using modified SSB, SSBAF488, or SSBf, but rather is due to an intrinsic, salt-induced conformational change resulting in intramolecular re-organization along the nucleoprotein fiber. The absence of hysteresis in our force-extension curves in the presence of SSB is strong evidence that the intramolecular condensation that we observe is not due to the formation of distant ssDNA–ssDNA contacts, but rather is driven by the microscopic reorganization of SSB along the ssDNA, which in turn contributes to a macroscopic folding of the molecule. Several structural polymer models might explain the condensed molecules that we observe, including the formation of solenoid or fractal structures; however, several interesting properties of SSB support the idea that intramolecular folding or condensation is protein-mediated. First, dimerization of SSB tetramers (i.e. octamer formation) is a well-established phenomenon at increasing but still physiologically relevant intracellular salt concentrations (Chrysogelos and Griffith, 1982; Bujalowski and Lohman, 1987), which can linearly vary from 0.23 to 0.93 molal K+ ion and from 0.03 to 0.26 molal glutamate ion in response to changes in the osmolality of the growth medium (Richey et al., 1987) see also, (Epstein and Schultz, 1965) (Epstein and Schultz, 1966). Second, SSB exhibits long-range, intersegmental transfer (Lee et al., 2014), the latter of which likely proceeds through direct, tetramer transfer within a ternary intermediate comprising SSB and two ssDNA molecules without proceeding through a free-protein intermediate (Kozlov and Lohman, 2002a, b). This property of SSB is possible owing to multiple, high affinity binding sites distributed around the tetramer, or as the case may be in the high-salt mode, octamers. This phenomenon has primarily been described as a transient intermediate during rapid, stopped flow kinetics; however, we believe that the intramolecular condensation that we observe here provides evidence that the sum of these transient interactions across the SSB-ssDNA fiber might explain how many SSB tetramers can simultaneously engage in distant ssDNA sites to contribute to an intramolecular, folded polymer that is highly dynamic and ‘fluid’, undergoing constant, steady–steady state protein turnover and diffusion at equilibrium. This is corroborated by the rapid exchange of SSB protein (Figure 1F) and the absence of net protein loss under steady-state conditions (Figure 1D–E and Figure 1—figure supplement 1), but the rapid dissociation in the absence of free protein during salt-jump experiments (Figure 2—figure supplement 1), as well as the ability of SSB labeled with different fluorophores to exchange and form mixed complexes (JCB, unpublished observations), a phenomenon also demonstrated for eukaryotic RPA (Gibb et al., 2014). Similar to nucleosomes, SSB binds and wraps a DNA polymer around itself (albeit ssDNA instead of dsDNA), interacts with dozens of proteins via a short acidic peptide tail, and exhibits complex cooperative and anti-cooperative behavior that is modulated by salt concentration. Our observation that SSB-ssDNA is macroscopically organized and regulated through microscopic interactions is surprisingly similar to the most basic organization of eukaryotic chromatin and highlights the important role of SSB, not simply as a kinetic trap for ssDNA, but as an organizational and regulatory scaffold during DNA metabolism (Shereda et al., 2008; Sun et al., 2015). This organizational and regulatory role is likely controlled by the acidic, intrinsically disordered C-terminal tail of SSB, which is required for cooperative binding of SSB to ssDNA (Kozlov et al., 2015). In the absence of interaction partners or ssDNA, this unstructured peptide tail interacts with the subunits within the SSB tetramer (Kozlov et al., 2010a). Recent studies have identified a cadre of proteins, including the χ subunit of DNA polymerase III, PriA, PriB, RecG, RNaseHI, Exonuclease I, and RecO, that bind to the C-terminal tail of SSB and either remodel the SSB-ssDNA complex or regulate enzymatic ssDNA metabolism (Cadman and McGlynn, 2004; Shereda et al., 2007, 2008; Lu and Keck, 2008; Kozlov et al., 2010a, 2010b, 2015; Wessel et al., 2013; Bhattacharyya et al., 2014; Petzold et al., 2015; Sun et al., 2015). Extrapolating from our observations in this work, these many proteins may regulate access to ssDNA by binding to SSB and altering either compaction/de-compaction most likely by perturbing the microscopic binding state of SSB. Indeed, we demonstrate that this condensation occurs not only with increasing osmolality, but also by the addition of RecO, which binds directly to SSB, in the absence and presence of RecR (Ryzhikov et al., 2011). As the C-terminal tail of SSB interacts with more than a dozen proteins involved in DNA replication, recombination, and repair (Shereda et al., 2008), our observation supports and expands upon the idea that these proteins might modulate the macroscopic condensation state of the SSB-ssDNA fiber by microscopically altering the binding mode, and therefore either grant or restrict access to the ssDNA. In the case of RecO and RecOR, altering this macromolecular state by bridging distant sites could reduce the three-dimensional space required to facilitate homology-dependent annealing of ssDNA (Berg et al., 1981; Forget and Kowalczykowski, 2012), which occurs by a second order kinetic process (Berg et al., 1981; Kantake et al., 2002; Wu et al., 2006; Bell et al., 2012). Similarly, RecO has been shown to slow the rate of one-dimensional diffusion, or sliding, of SSB on ssDNA (Zhou et al., 2011), which is consistent with the small energy contribution of RecO and RecOR binding we observe here, where RecO contributes an additional ∼1–2 kBT per SSB tetramer. By slowing the rate of diffusion of SSB on ssDNA, RecO might facilitate both annealing and RecA nucleation by increasing the lifetime of transiently exposed ssDNA. The long range interactions induced by RecR could also be due to phasing of SSB via its interaction with RecO, creating microscopic gaps on the ssDNA that allow distant sites with micro-homology to anneal, forming intramolecular secondary structure (Figure 5D). In its biological context, these microscopic gaps could also facilitate the nucleation of RecA filaments during homologous recombination by exposing short segments of ssDNA between SSB tetramers, either by inducing a conformational change that physically disrupts the SSB-ssDNA complex to create gaps or by increasing the lifetime of transiently exposed ssDNA created during SSB sliding along the ssDNA (Bell et al., 2012). Fluorescent SSB was generated by conjugating either Alexa Fluor 488 maleimide or fluorescein-5-maleimide (Life Technologies) to SSBG26C as previously described (Dillingham et al., 2008). Bacteriophage λ DNA (1.5 nM molecules) was biotinylated by incorporating biotin-dGTP (50 μM) at the 3′-ends of DNA using T7 Polymerase (10 Units) in NEB Buffer 2 (10 mM TrisHCl (pH 7.9), 50 mM NaCl, 10 mM MgCl2, and 1 mM dithiothreitol (DTT)) in the presence of 50 μM dATP, dCTP, and dTTP for 15 min at 12°C. The reaction was terminated by the addition of 20 mM EDTA and incubated at 75°C for 10 min. The biotinylated dsDNA was purified from unincorporated biotin-dGTP using an S-400 spin column equilibrated with 20 mM TrisHCl (pH 7.5) and 0.1 mM EDTA. This biotinylated dsDNA was then diluted to 250 pM (molecules) in 10 μl of 0.5 M NaOH for 10 min at 37°C and subsequently diluted into 400 μl of buffer containing 20 mM TrisOAc (pH 8.0), 20% sucrose, 50 mM DTT, and 200 nM of the indicated SSB-derived biosensor. The final concentration of ssDNA was 12.5 pM molecules or 600 nM nucleotides. The ssDNA-nucleoprotein complexes were then injected into a flow cell and tethered to the surface of a coverslip. Flow cells (4 mm × 0.4 mm × 0.07 mm) were assembled using a glass slide, a coverslip, and double-sided tape (3M Adhesive Transfer Tape 9437). Ports were drilled into the glass microscope slide, and flow was controlled using a motor-driven syringe pump (Amitani et al., 2010; Forget and Kowalczykowski, 2010, 2012). The surface of the coverslip was cleaned by the subsequent injection of 1 M NaOH for 10 min, rinsed with water and equilibrated in buffer containing 20 mM TrisOAc (pH 8.0), 20% sucrose and 50 mM DTT. The surface was then functionalized by injecting the above buffer containing 2 mg/ml biotin-BSA (Pierce) and incubated for 10 min, rinsed with buffer, equilibrated with 0.2 mg/ml streptavidin (Promega) for 10 min and then blocked with 1.5 mg/ml Roche Blocking Reagent (Roche) for 10 min. 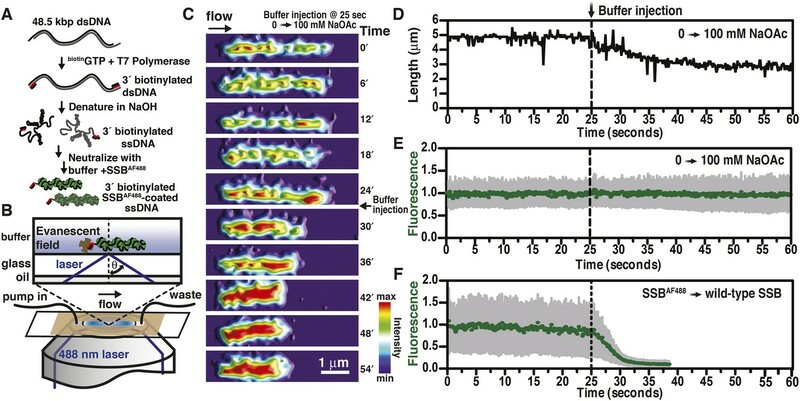 For imaging, the nucleoprotein complexes were allowed to incubate in the flow cell in the absence of flow for approximately 5–15 min until a sufficiently desired density of molecules were tethered to the surface, then visualized using TIRF microscopy while extended by flow at volumetric flow rate of 4000 μl/hr. Unless otherwise noted, imaging was performed in 20 mM TrisOAc (pH 8.0), 50 mM DTT, 20% sucrose, and the indicated concentration of NaOAc or Mg(OAc)2. Unless otherwise indicated (as in Figure 2), the concentration of SSB was 200 nM (monomers). Titrations to monitor the binding of SSBf to ssDNA were performed by monitoring the fluorescence enhancement at 25°C, using a Shimadzu fluorescence spectrophotometer set at an excitation wavelength of 495 nm and an emission wavelength of 520 nm. Excitation and emission slits were set to a bandwidth of 3 and 10 nm, respectively. The concentration of SSBf was 100 nM (tetramer). Titrations were performed in 20 mM TrisOAc (pH 8.0), 1 mM DTT, and the indicated concentration of salt. The fluorescence values were corrected for dilution and normalized to the fold increase in fluorescence (fluorescence intensity of SSBf plus ssDNA divided by the SSBf fluorescence in the absence of ssDNA). The site size of SSB was determined by fitting the data to a two-segment line, where the x- and y-intercepts of the first segment and the slope of the second segment were constrained to zero. The x-intercept between the segments was taken to be the stoichiometric breakpoint of the titration. Data fitting was performed using GraphPad Prism version 5.0d. All equilibrium titrations were performed in triplicate and report the mean and standard deviation from each experiment. The multiple-DIG and multiple-biotin labeled 2-kb DNA handles were prepared using pUC19, which was linearized by HindIII, as the template. The primer sequences for multi-DIG labeled 2-kb DNA handle were primer-1 (5′-GTT GTG GGC CCG GCG TAA TCA TGG TCA TAG CTG-3′) and primer-2 (5′-CAA CAT TTC CGT GTC GCC CTT ATT CCC-3′). Primer-1 creates a restriction site for ApaI (underlined); dsDNA length is 2036 bp after PCR and 2026 bp after Apa1 digestion. PCR was performed in the presence of 0.2 mM dATP, dGTP, dCTP, 0.18 mM dTTP, and 0.02 mM DIG-11-dUTP (Roche) using Taq DNA polymerase (NEB). For the DNA handle containing biotin, primer-3 (5′-GTT GTG CTA GCG GCG TAA TCA TGG TCA TAG CTG-3′) was used instead of primer-1. Primer 3 creates a restriction site for NheI (underlined); dsDNA length is 2036 bp after PCR and 2030 bp after NheI digestion. The PCR was performed in the presence of 0.2 mM dATP, dCTP, dTTP, 0.18 mM dGTP, and 0.02 mM biotin-11-dGTP (Perkin–Elmer). The ∼13.5-kb DNA was prepared using lambda DNA as the template using primer 4 (5′-GTT GTG GGC CCA CCA CCT CAA AGG GTG ACA G-3′) and primer 5 (5′-GTT GTG CTA GCA CGG TGG AAA CGA TAC TTG C-3′) to produce dsDNA 13,572 bp in length. These primers create restriction sites for ApaI and NheI (underlined), respectively. PCR was performed using Expand 20kbPLUS PCR system (Roche). The PCR products were digested with appropriate restriction enzymes to yield dsDNA 13,552 bp in length and purified using a Qiagen PCR purification kit (Qiagen). All three pieces of DNA were ligated in a single step. Flow cells were assembled by sandwiching double-sided tape (3M Adhesive Transfer Tape 9437) from which a rectangular channel had been cut with a precision controlled razor blade printer (Craft Robo CC200-20, Graphtec) between a Mylar sheet (0.002′′, McMaster) and a coverslip (No. 1;113 Corning). Flow cells were washed with water, phosphate buffered saline (PBS; Gibco #10010; 1 mM KH2PO4, 3 mM Na2HPO4, and 155 mM NaCl, pH 7.4) and then coated with 0.2 mg/ml anti-digoxigenin (Roche) in PBS by incubating at 37°C overnight. Unbound anti-digoxigenin was rinsed with PBS. The surface was blocked for at least 2 hr at 37°C with a solution containing 10 mg/ml BSA (Sigma), 3.3 mg/ml poly-L-glutamic acid (Sigma) in 45 mM NaHCO3 (pH 8.1) and 50 mM DTT. The blocking agent was rinsed from the flow cell using single molecule buffer (SMB) containing 20 mM TrisOAc (pH 8.0) and 50 mM DTT, and then blocked again using 1.5 mg/ml Roche blocking reagent (RBR) dissolved in SMB plus 1 M NaOAc for 30 min, followed by a successive incubation of 1.5 mg/ml RBR in SMB (no salt) for an additional 30 min. The flow cell was mounted onto a PicoTwist microscope (PicoTwist, Paris, France) so that the Mylar is under tension. The position of the magnets was carefully adjusted so that the distance between the magnets and the flow cell surface was accurate and calibrated according to the manufacturer's specifications. The DNA substrate was incubated in 0.5 M NaOH to denature the dsDNA to ssDNA, which was then attached to magnetic beads (1 μm MyOne C1 Dynal) by mixing biotinylated ssDNA and the beads in ∼5:1 molar ratio in SMB and incubating on a slow rotator for 15 min at room temperature. The ssDNA-bead mixture was added to the flow cell. After 10-min incubation at 25°C, untethered beads were eliminated by extensive washing with SMB. Changing the position of the magnets controlled the force. Flow was driven by gravity. The flow cell was sealed by switching off the inlet and outlet valves after buffer exchange, the magnets were moved to their destination position, and data collection began. After each force-extension curve was obtained, the buffer in the flow cell was exchanged to increase the concentration of salt, and the experiment was repeated. Experiments containing SSB were similarly obtained, where the force-extension curve of ssDNA alone was obtained in the absence of salt, then plus 200 nM SSB, and finally incrementally increasing the salt concentration but maintaining a constant concentration of SSB. All experiments were performed in SMB plus the indicated concentration of salt at 25°C. RecO and RecR were purified as previously described (Kantake et al., 2002). Experiments were performed by sequentially adding each of the following components to SMB and injecting the solution into the flow cell after ssDNA-bead complexes were tethered to the surface: 100 mM NaOAc and 1 mM Mg(OAc)2, 200 nM SSB, 100 nM RecO, and 1 μM RecR. Each additional component was added to the previous buffer, and the molecules were allowed to equilibrate for 5–10 min before the experiment. The change in energy was measured using the ‘Area Under Curve’ (AUC) function in GraphPad Prism (v5.0d) for each molecule at either increasing or decreasing force and subtracting the AUC for ssDNA alone in the absence of salt. 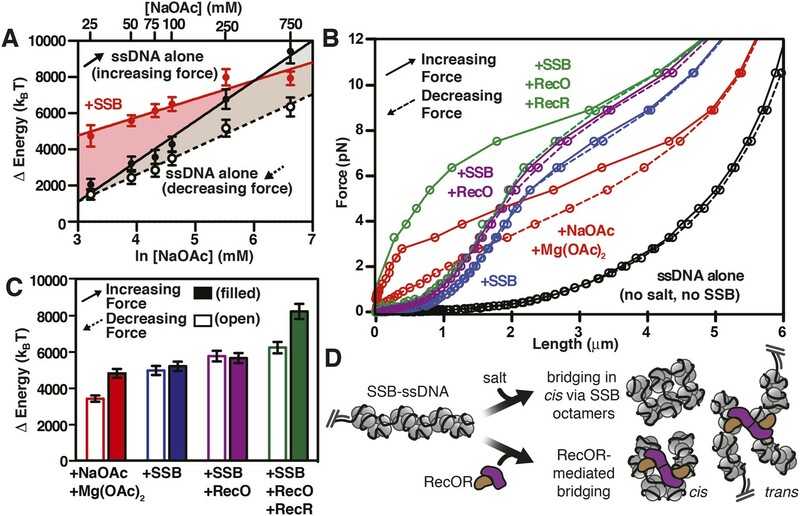 At the highest salt concentration measured (750 mM NaOAc), 17.5 pN was sufficient to completely dissociate SSB from ssDNA, as ascertained by the convergence of the force-extension curve with ssDNA alone. At all other salt concentrations, the maximum force applied was 10.5 pN, and the curve was completed by extrapolating between the 10.5 pN and 17.5 pN in order to complete the curves to calculate the integrated area. By comparing the measurements in the 750 mM NaOAc data set with a linear extrapolation from 10.5 pN to 17.5 pN, we calculate that this analysis contributes no more than 370 pN•nm to the error in our measurement, which is reflected in the error bars in Figures 6B and 6D. The AUC was converted from energy units of pN•nm to kBT using the conversion, 1 kBT ∼ 4.1 pN•nm (Nelson, 2004). In: NG Walters, editors. Single molecule tools: fluorescence based approaches, part A. Burlington: Academic Press. pp. 261–291. 244, Biochemistry and molecular biology, Davis, University of California, Davis. Proceedings of the National Academy of Sciences of USA 111:1373–1378. Journal of Molecular Biology 195:897–907. Journal of Molecular Biology 207:249–268. Journal of Molecular Biology 207:269–288. The Journal of Biological Chemistry 263:4629–4640. Proceedings of the National Academy of Sciences of USA 79:5803–5807. The Journal of General Physiology 49:221–234. The Journal of General Physiology 49:469–481. Journal of Molecular Biology 236:106–123. Trends in Cell Biology 20:269–276. Cold Spring Harbor Symposia on Quantitative Biology 49:553–559. Proceedings of the National Academy of Sciences of USA 99:15327–15332. Journal of Molecular Biology 145:75–104. The Journal of Biological Chemistry 285:17246–17252. Journal of Molecular Biology 427:763–774. Journal of Molecular Biology 426:2413–2421. Annual Review of Biochemistry 63:527–570. The Journal of Biological Chemistry 260:3594–3603. Journal of Molecular Biology 187:603–615. Proceedings of the National Academy of Sciences of USA 105:9169–9174. Current Opinion in Structural Biology 19:615–622. The Journal of Biological Chemistry 287:35621–35630. New York: W.H. Freeman and Company. Journal of Molecular Biology 145:105–121. The Journal of Biological Chemistry 290:14626–14636. The Journal of Biological Chemistry 262:7157–7164. Journal of Molecular Biology 369:1244–1257. Journal of Biomolecular Structure & Dynamics 8:1233–1250. The Journal of Biological Chemistry 282:19247–19258. Critical Reviews in Biochemistry and Molecular Biology 43:289–318. Proceedings of the National Academy of Sciences of USA 90:3875–3879. The Journal of Biological Chemistry 269:30005–30013. The Journal of Biological Chemistry 288:17569–17578. The Journal of Biological Chemistry 281:15441–15449. Thank you for submitting your work entitled “Imaging and energetics of single SSB-ssDNA molecules reveal intramolecular condensation and insight into RecOR function” for peer review at eLife. Your submission has been evaluated by James Manley (Senior editor) and three reviewers, one of whom is a member of our Board of Reviewing Editors. The reviewers have discussed the reviews with one another and the Reviewing editor has drafted this decision to help you prepare a revised submission. Bell et al. examine the properties of single molecules of SSB-coated ssDNA using TIRF microscopy and force spectroscopy (magnetic tweezers). The first set of experiments use tethered single-stranded Lambda DNA coated with fluorescently labeled SSB in a flow cell to image the condensation/length of the molecules in response to salt titrations. The degree of condensation is greater than what was expected based on simple binding mode transitions, and it is suggested that this is due to long-range intramolecular interactions. The second set of experiments use force spectroscopy to generate force-extension curves of Lambda ssDNA coated with unmodified SSB in the absence and presence of RecO/RecOR. The results from this indicate that addition of RecO alone further shortened the nucleoprotein fiber and the addition of RecOR induced significant hysteresis suggesting RecR is bridging distant contacts within the nucleoprotein fiber. The authors conclude that RecOR binding to SSB-ssDNA modulates the binding mode of SSB and serves as a scaffold to condense distant sites on the nucleoprotein fiber. The data in this manuscript are well presented and the novel insights into the binding mode transitions that the E. coli SSB can assume are intriguing. The idea that the overall condensation state of the SSB/single strand DNA filament may be able to change as a result of higher order interactions with other proteins has been around for some time. However, the work presented here for the recombination proteins seems rather definitive and important. In summary, this is certainly an interesting study and the SSB-induced ssDNA compaction observed at high salt may be larger than expected based on the known SSB-ssDNA binding mode transitions in the literature. However, the extent of any additional compaction of ssDNA by SSB beyond that expected based on the SSB-ssDNA binding mode transitions is difficult to assess quantitatively. In particular the major problems raised by all three reviewers concerns perhaps the validity of predicting expected compaction of ss lambda DNA by SSB should be based on site sizes measured with polydT (for example see point 4 and 7 below). 1) The manuscript addresses the transitions in binding modes as a function of salt concentrations and the reviewers don't understand how the present data can be reconciled with published similar measurements albeit with different tools that the authors mention. In these previous studies such dramatic compaction was not reported. This was confusing and perhaps a discussion clarifying the anticipated reasons for the differences could be made. 2) Seeing is believing, but given the low spatial resolution of the methods certain structural assumptions need to be made with regard to fiber dimensions and as such compaction calculations are perhaps potentially in error? Is the model put forward that the compaction is due to long range interactions between different SSB tetramers the only one that can explain the data? 3) The analogies to nucleosome condensation with salt changes is intriguing but the physiological relevance of this phenomenon has yet to be established for chromatin. While osmolarity changes in a prokaryote cell should be significant are they in the range used by Bell et al. for E. Coli in its natural environment? Perhaps some references here are appropriate. 4) It is well established that E. coli SSB can bind single stranded DNA in multiple binding modes that differ in the extent of wrapping of the ssDNA around the tetramer. In experiments with poly(dT), binding modes with occluded site sizes of ∼35, 40, 55 and 65 nucleotides per tetramer have been identified. The relative stability of these modes can be modulated in vitro by changing the salt concentration. As the salt concentration is increased, the mode of binding shifts from the 35 mode to the higher site size modes, resulting in progressive compaction of the ssDNA. These different binding modes also display very different cooperative behavior. The binding mode transitions have also been demonstrated by sedimentation, EM and AFM measurements. The previously reported occluded site size measurements as a function of salt type and concentration have generally been performed using poly(dT) in order to eliminate complications due to secondary structure (hairpins, etc.) that will form in natural ssDNA, such as M13 or lambda DNA that is used in the current study. In the original report of salt-induced SSB binding mode transitons (Lohman & Overman (1985)) the apparent site sizes measured using poly(dT) were compared with measurements using ss M13 phage DNA. These showed that the apparent site size is severely overestimated when M13 ssDNA is used and that the discrepancy increases as the salt concentration increases (e.g., 65 nt for pol(dT) vs. 77 nt for M13 DNA at 0.3 M NaCl). This difference will be greater at higher salt concentrations. This difference is due to the fact that SSB, especially at high salt concentrations is unable to remove all of the secondary structure from natural ssDNA. This is partly because SSB does not bind with high cooperativity in the 55 or 65 modes. Therefore, the uncertainty in predicting what the expected compaction of ss lambda DNA based on site sizes measured on polydT makes the main conclusion difficult to assess. The authors need to address this before the manuscript can be published. 5) As the authors mention, the extent of ssDNA compaction observed by both EM (Griffith) and AFM (Harmon et al.) studies is consistent with the extent of compaction expected from the SSB binding mode transitions. Compaction as measured by sedimentation studies (Bujalowski et al. (1988) JBC 263, 4629) show that compaction tracks with occluded site size, when both measurements are performed with poly(dT). It seems that the additional ssDNA compaction suggested in the current study should be observable also by these techniques, but none has been reported. Why? 6) Bell et al. use minimum and maximum dimensions of SSB of 6 nm and 8 nm for the calculation of the “expected” extent of ssDNA compaction, but do not explain how they arrived at these estimates. Reviewers agree with the 8 nm estimate, which is from the tips of the L45 loops in the crystal structure. However, the other dimension from the crystal structure can be as small of 4.5 nm. When the calculation is done using 4.5 nm, the predicted length lower limit is lowered by 25%, which encompasses all of the data points except for the two at the highest salt concentrations. These two points are subject to the caveats mentioned elsewhere in the review. 7) Bell et al. measured the SSB-induced ssDNA compaction using mixed sequence ssDNA (lambda), whereas the site size measurements are made using poly(dT). Hence, some of the “unexpected” additional compaction is certainly due to unmelted secondary structure in the lambda DNA. How much is not clear. The difference in site sizes measured using poly(dT) vs. natural ssDNA (mixed sequence) will be greater at the higher salt concentrations (> 0.3 M), consistent with the authors reporting the largest “additional unexpected” compaction at these higher salt concentrations. 8) Potential SSB dissociation. The authors initially state that the amount of SSB bound to the ssDNA during the collapse transition is “essentially constant”, attributing the loss of SSB fluorescence to photobleaching. Yet they also show that at the very high salt concentrations (> 750 mM), some of the SSB does dissociate, although this is not considered to be a major factor. The question is how much dissociates and is it reasonable to dismiss this? SSB does not bind as tightly to natural ssDNA as it does to poly(dT), hence this is likely not inconsequential. Please explain. 9) Could the constant fluorescence intensity observed upon shortening of the molecule (Figure 1E) be the result of altering the environment of the fluorophore? As indicated, this result is surprising given that increasing the salt should theoretically decrease the number of available binding sites on the ssDNA. Is constant fluorescence observed when no free SSB is included in the flow (Figure 2)? Additionally, we are missing the connection for how this result led to the authors asking whether condensation is reversible (subsection “Single molecules of SSB-coated ssDNA reversibly condense in response to increasing salt concentration”. “We therefore asked”) – clarification on the reasoning as well as a brief mention of possible explanations would be beneficial in this section. 10) Is the salt-induced condensation reversible with free protein and not just in the absence of it (Figure 2)? 11) Clarify how the values plotted in Figure 3B were obtained – was a specific nt/SSB ratio used or were titrations done as in 3A for all of the [NaOAc] in 3B? 12) In the subsection “Force spectroscopy of single molecules of ssDNA and SSB-coated ssDNA reveals a nearly complete relief of hysteresis in SSB-ssDNA unfolding transitions”, second paragraph, it is mentioned that the modest hysteresis at high [NaOAc] is consistent with the interpretation that the decrease in fluorescence enhancement with SSBf at high [NaOAc] is due to partial dissociation. This is the first time that this interpretation and the fact that fluorescence enhancement decreases at high [NaOAc] is mentioned – a brief discussion should be provided earlier within the Results section referring to Figure 3. 13) The figure description for Figure 5A is difficult to follow. In the figure it appears as though purple and gray represent a single area (separate from light purple), however the description seems to be written as if they are all separate. 14) The discussion of nucleosomes and chromatin seems unnecessary - the statement “our observation that SSB...during DNA metabolism” (Discussion, third paragraph) would be sufficient and can be added on to the end of the preceding paragraph. 15) The suggestion in the Discussion that SSB-interacting partners might modulate the condensation state of the SSB-ssDNA fiber by altering the binding mode is supported by work on the interaction between SSB and both PriA and PriC (Bhattacharyya et al. 2014, Wessel et al. 2013). Both proteins have been shown to induce the 35nt binding mode of SSB in a manner dependent upon complex formation. 2) Does increasing salt concentration cause SSB to dissociate and secondary structure to form, and would this ‘ssDNA collapse’ explain the condensation observed? We first address these issues generally, and then we will refer back to our general comments, where applicable, as we address the more specific issues point-by-point. With respect to major issue #1, after considering the reviewers’ comments, we feel that our original Figure 3A was taken more literally than we had intended. The figure panel was meant to illustrate the surprising result that SSB-ssDNA compacted more than we initially anticipated based on the published results in Hamon et al., where they observed a contour length of 920 nm at low salt concentration, where SSB is typically in the “SSB35-mode”, and 560 nm in a higher salt concentration, where it is in the “SSB65-mode”. This change in length (920 nm vs. 560 nm) represents a 1.6-fold increase upon going from high to low salt, or a decrease of 60% upon going from low to high salt. Since lambda DNA is 6.6-fold longer than ssM13, we anticipated our SSB-ssDNA molecules should be ∼6.1 um in the low salt, SSB35-mode and decrease by 60% to ∼3.7 um in the high salt SSB65-mode. Both of these DNA molecules are natural, mixed sequences, and we expect their propensity to form secondary structure should be similar and comparable. Though we still refer to these lengths and the typical SSB-binding modes in the text, because we now focus our comparisons to observed native DNA lengths, we have removed the figure plotting our measured site size vs. length, have clarified the different ssDNA molecules used in the individual panels in Figure 3, and have removed the panel (E) showing length predictions. Our measurements at 250 mM NaOAc should be comparable with the 300 mM NaCl measurements from the Hamon paper, yet our molecules are fully half the expected length (∼2 um measured vs. ∼3.7 um expected). We note that both of these experiments were performed on natural ssDNA, and if anything, we expected our molecules to be longer owing to extension in flow and the absence of spermidine (which they used to adsorb the molecules in the AFM experiment, and which condenses both ssDNA and dsDNA). Our intensity measurements indicate that the amount of fluorescent protein doesn’t change in the salt-jump experiments up to 400 mM NaOAc, where we see begin to see a modest 7% decrease in intensity – this result shows that the SSB has not dissociated at 250 mM NaOAc. At lower salt concentrations, we see no net dissociation of fluorescent SSB when SSB concentrations are held constant. To clarify this important point, we have also included supplemental panels for Figure 1, showing intensity measurements on SSB-ssDNA molecules during the length transitions at multiple salt jumps. Using a well-established standard ensemble method, we used poly(dT) to determine the intrinsic site size for our fluorescent SSB protein, under our conditions. These measurements allowed us to determine the dominant, intrinsic binding mode for SSB at each concentration of salt used in our single molecule experiments. Poly(dT) is used as the polynucleotide of choice for SSB-binding experiments precisely for the reasons mentioned by one of the reviewers – the absence of secondary structure reduces the complexity of interpreting the site size determined using stoichiometric titrations (or affinity, as the case may be). We used these experiments as verification that our SSB protein is behaving as expected under our conditions, using this method that has been extensively documented by the Lohman lab. With respect to major issue #2, SSB dissociation is something that we considered seriously, and in fact, we initially dismissed the hyper-condensation of the SSBf-ssDNA fiber based on this interpretation; however, after careful examination of both the fluorescent intensity of the SSBf-ssDNA fibers during the salt jump transitions, and (even more convincingly) the force-spectroscopy with wild-type, unlabeled ssDNA, we came to the conclusion that protein dissociation was negligible or non-existent in all conditions when free SSB is present, except 750 mM NaOAc, and that dissociation could not fully account for our observations. 2) that the larger site size represented unoccupied ssDNA, thereby reflecting a fully wrapped, 65 nt binding mode, while 15% of the ssDNA is occluded owing to secondary structure formation. These need not be mutually exclusive, but the second interpretation is the one that is favored in the literature, and we agree with this interpretation of ensemble, equilibrium binding experiments. As stated above, we initially shared the reviewers’ concerns that the greater degree of condensation observed in the TIRF experiments might be due to formation of secondary structure, and this was stated (both in the revised and original submission) as our reasoning for using force spectroscopy (magnetic tweezers) with wild-type, unlabeled SSB. This assay is extremely sensitive, and allowed us to measure the condensation of the SSB-ssDNA fiber (on a long, natural ssDNA substrate) as a function of both force and salt perturbation. When we compared force-extension curves for either ssDNA or SSB-coated ssDNA, we noted that a dramatic difference is apparent in the hysteresis of the curves. We interpret the absence of hysteresis in the presence of SSB as strong evidence that long-range DNA secondary structure is not capable of excluding SSB and contributing to condensation until the concentration of NaOAc was increased to 750 mM. This is readily apparent when we calculate the ΔΔE (energy) by subtracting the ssDNA-alone relaxation curves (which do not include the energetics of long-range secondary structures; see subsections “Force spectroscopy of single molecules of ssDNA and SSB-coated ssDNA reveals a nearly complete relief of hysteresis in SSB-ssDNA unfolding transitions” and “The SSB-ssDNA complex is a nearly isoenergetic landscape, relative to unstructured ssDNA, at physiological salt concentrations” for discussions and references) from the SSB-coated ssDNA curves at each salt concentration, where we see a nearly uniform binding energy, with the sole exception of the 750 mM NaOAc condition (new Figure 5–figure supplement 2). Therefore, at least in our magnetic tweezers experiment where some force is always being exerted on the molecule owing to the bead tethering (in contrast to the ensemble equilibrium binding described in the paragraph above), no measureable long-range secondary structure forms in the presence of SSB. Based on the sum of our observations, i.e., the absence of noticeable intensity changes in the SSB-ssDNA fiber and the good agreement between our TIRF data and our magnetic tweezer experiments, we think that higher-ordered condensation of the SSB-ssDNA complex is the most correct explanation for our observations. The model that we propose, where SSB-mediates this condensation via SSB-SSB interactions or by engaging in multiple SSB-ssDNA interactions within single tetramers, rather than ssDNA hybridization, is largely warranted based on the complex properties of SSB, but it is a model nonetheless. We have expanded our Discussion to consider other possible explanations mentioned by the referees. That said, in the condition where free SSB is omitted from our experiment, as in Figure 2 and Figure 2–figure supplement 1, we do observe protein dissociation during the time needed to measure condensation of the SSB-coated ssDNA fiber. We therefore conclude that the structural re-arrangements that we observe and the relatively constant amount of protein bound to the ssDNA, is normally driven or maintained through reversible mass action with free SSB. Given the similarity of these comments, we address them together for brevity. Neither the EM or AFM studies explored a significant range of salt concentrations, and in fact, were rather limited in the range of conditions tested. Perhaps more importantly, both methods require experimental conditions that physically “spread-out” DNA or protein-DNA complexes. Consequently, they are in fact quite perturbing of structures that are held together by weak interactions. Furthermore, if the spreading is not successful, then neither EM nor AFM studies will publish such structures because they appear as condensed, amorphous “blobs”. Hence, we offer these two reasons as possible explanations for why condensation was not reported earlier. In the case of the EM papers, the experiments were designed to evaluate the morphology of the complexes as a function of SSB saturation and/or RecA filament-mediated displacement of SSB. The Hamon paper explored a rather limited range of salt concentrations, primarily focusing on developing a method to adsorb and spread SSB-ssDNA complexes onto mica for imaging, reporting contour lengths for only two conditions (20 mM TrisHCl (7.5), 20 mM NaCl and 50 uM spermidine or 20 mM TrisHCl (7.5), 300 mM NaCl, and 300 uM spermidine). Interestingly, they do show images of SSB-ssDNA complexes formed in 12 mM MgCl2 in their Figure 1, and these complexes form “highly condensed complexes that do not spread well”, consistent with our observations of strong, Mg(OAc)2-dependent compaction, but as a consequence of this highly condensed structure, they do not report measurements of these complexes. We also note that such condensed complexes can be easily dismissed by critics of AFM as being structures that aggregated on the ionic mica surface and perhaps “artifacts”. We did attempt to use AFM to image condensed complexes; however, we ran into two technical problems. We verified that conditions permitting condensation similarly resulted in poorly spread complexes that could not be used to measure contour lengths and resulted in poor imaging conditions owing to salt and aggregates on the mica. Removal of the salt requires rinsing the samples, which obviously perturbs the intramolecular condensation of the molecules, and we know from our TIRF experiments that condensation, decondensation and remodeling are rapid. Given these technical problems – as well as the complication of requiring spermidine for surface adsorption – we reasoned that the force spectroscopy experiments would be the most accurate method for measuring contour lengths at increasing salt concentrations using wild-type unlabeled SSB. We cannot make a direct comparison to Bujalowski et al. (1988) because their sedimentation studies were done as a function of Mg++ concentration; in addition, their concentration of SSB was sub-saturating (either 101 or 87 nts per tetramer). However, upon scrutinizing the older literature, we discovered that in largely underappreciated work, Schaper et al., (1991) examined the sedimentation of SSB-coated ssDNA using native M13 ssDNA under conditions where the ssDNA was both under- and super-saturated. When excess SSB was present (as in our conditions), they observed a log-linear relationship between the sedimentation coefficient and salt concentration. We have extracted the values from their paper, and we have plotted those values against the length measurements from our single-molecule assays. We think that it is obvious that the log-linear trend is the same, indicating that our observations and method are in fact in good agreement with Schaper et al (Author response image 1). We refer the reviewers to our general response above. However, “low spatial resolution” depends on the point of reference and the structural scale of the conclusion. The resolution in our TIRF experiment is ∼200-300 nm; however, the resolution in our magnetic tweezer experiments is on the order of a few nanometers (precise resolution changes with the amount of force applied). Certainly several structural models could be advanced, including folding of the fiber into solenoid or fractal structures; however, our experiments are not informative as to what these structural features are. In the Discussion section we discuss that the molecular interactions could be explained by either tetramer-ssDNA interactions (for example, if tetramers do not strictly bind to ssDNA only contiguously, but rather as two or more discrete binding entities, similar to the tetramer bound to two molecules of 35-mer in the crystal structure), or through tetramer-tetramer interactions. Alternatively, long-range interactions could be explained by re-annealing of the ssDNA as secondary structure forms. Because the magnetic tweezers experiments allow us to directly measure secondary structure formation, which is apparent in the hysteresis when pulling vs relaxing curves are compared, we are able to directly eliminate this latter explanation for all of our conditions except when 750 mM NaOAc was used. A) Dimerization of SSB tetramers (i.e., formation of octamers) is a well-established phenomenon (Chrysogelos & Griffith, PNAS (1982)). B) SSB diffuses on ssDNA rapidly and undergoes intersegmental transfer (Roy et al., Nature (2009), Zhou et al., Cell (2011) & Lee et al., JMB (2014)) across long distances. C) SSB tetramers can directly transfer between ssDNA molecules without proceeding through a free-protein intermediate (Kozlov & Lohman, Biochemistry (2002, a&b); thus, this transient intermediate may be iteratively sustained along a long DNA molecule, and can contribute to the overall folding of the SSB-ssDNA fiber. The intracellular salt concentrations of E. coli are very well documented using careful analytical methods by Tom Record’s lab. As stated by Richey et al. [in “Variability of the intracellular ionic environment of Escherichia coli. Differences between in vitro and in vivo effects of ion concentrations on protein-DNA interactions and gene expression.” J Biol Chem 262(15): 7157-7164, (1987)], “As the osmolality of the growth medium is varied from 0.1 to 1.1 osmolal, the total intracellular concentration of K+ increases linearly from 0.23 to 0.93 molal and the total intracellular concentration of glutamate increases linearly from 0.03 to 0.26 molal.” The biological significance of the condensation phenomenon we report is consequently physiologically relevant to changes in intracellular salt concentrations due to external changes in osmolality that are experienced by E. coli. This is further discussed in the subsection “The extent of intramolecular condensation of SSB-coated ssDNA exceeds expectations based on simple wrapping or binding-mode transitions” of the Results section, explaining our reasoning for performing experiments with potassium glutamate and magnesium ion. There is a long history on this important subject, which we cannot review in our manuscript; the interested reviewer is also referred to work by Wolf Epstein’s lab: e.g., Epstein, W. and S. G. Schultz (1965). “Cation Transport in Escherichia coli: V. Regulation of cation content.” J Gen Physiol 49(2): 221-234 and Epstein, W. and S. G. Schultz (1966). “Cation transport in Escherichia coli. VI. K exchange.” J Gen Physiol 49(3): 469-481. We have significantly reduced our discussion of nucleosomes. The SSB tetramer is roughly an ellipsoid of the dimensions 5 x 6 x 8 nm, with a surface groove (or ‘cinch’) around the waist that can be as small as 4 nm. After re-examining the SSB structure, we agree that we over-estimated the smallest possible axis. Nonetheless, as one reviewer pointed out in comment 2, these calculations make certain assumptions about the fiber conformation. Consequently, for reasons explained above, we have removed the figure, and instead refer to the relative length changes observed by AFM in Hamon et al. We think that this comment also relates to both of the major issues that were noted and addressed in our general response above. In addition, we now also provide intensity measurements for the molecules shown in Figure 1 (see Figure 1–figure supplement 1) and also provide the intensity measurements for all molecules summarized in Figure 3E, plotted as a scatter plot as a function of salt concentration in Figure 3–figure supplement 3. It is not our intention to dismiss the possibility of SSBf dissociation, especially in the experiment presented in Figure 2, where free SSB is not available. In fact, we think it is quite clear that the fluorescent SSB does dissociate under those conditions; however, all other experiments were performed under conditions where free SSB was available to rebind before, during, and after length transitions that coincide with salt and/or force perturbations. We did explicitly state that there would be dissociation at 750 mM, but we now explicitly excluded this condition from our discussions and we note that all of our conclusions remain valid even if this concentration is excluded. We have further analyzed the images in Figure 2 to quantify the dissociation in the absence of free protein. 9) Could the constant fluorescence intensity observed upon shortening of the molecule (Figure 1E) be the result of altering the environment of the fluorophore? As indicated, this result is surprising given that increasing the salt should theoretically decrease the number of available binding sites on the ssDNA. As we indicate in the text, the single-molecule experiments were performed with SSB labeled with AF488, while the equilibrium titrations were performed with SSB labeled with 5,6-carboxyflourescein. This is because AF488-labeled SSB is brighter and does not photobleach as quickly as fluorescein-labeled SSB, and is less sensitive to environmental changes induced by binding. Therefore, AF488-labeled SSB is most well suited for single-molecule measurements, and fluorescein-labeled SSB is more suitable for traditional, ensemble measurements. In the absence of salt, we have observed a 2.6-fold increase in fluorescence upon polydT binding to SSB-AF488, but only a 2.2-fold fluorescence enhancement in the presence of salt (200 mM NaOAc and 5 mM Mg(OAc)2). Therefore, the AF488-labeled ssDNA is actually slightly quenched (∼15%) in its fluorescence rather than enhanced upon the transition to higher salt conditions. For a ‘salt jump’ from 100 to 250 mM (as shown in Figure 1), the expected site size change for M13 ssDNA should be, per Lohman and Overman (1985), 62 nt at 100 mM to 77 nt at 300 mM, corresponding to a ∼24% change to slight higher salt concentration, and yet, we observe a 40% change in length, with no change in total fluorescence, but rather a concentration of the fluorescence as the fiber condenses. Also, please see our response to the following question. Is constant fluorescence observed when no free SSB is included in the flow (Figure 2)? No, the fluorescence decreases. We have included a new Supplement to Figure 2 (Figure 2–figure supplement 1), where we have analyzed and quantified the intensity of the molecules shown in Figure 2. This figure shows that 20% of the SSB dissociates in the 0 to 100 mM NaOAc transition, and 60% of the protein dissociates in the 0 to 400 mM NaOAc transition. When the salt concentration decreases back to 0 mM, we do not observe any additional intensity change, indicating that the single-molecule measurement with SSB-AF488 is insensitive to the molecular environmental changes coinciding with condensation and de-condensation. Additionally, we are missing the connection for how this result led to the authors asking whether condensation is reversible (subsection “Single molecules of SSB-coated ssDNA reversibly condense in response to increasing salt concentration”. “We therefore asked”) – clarification on the reasoning as well as a brief mention of possible explanations would be beneficial in this section. We have added clarification to the subsection “Single molecules of SSB-coated ssDNA reversibly condense in response to increasing salt concentration” of the revised manuscript. Yes, this is most obvious in the force-extension traces, but it is also true of the experiments performed in Figure 1 and throughout the rest of the manuscript. The fold-increase in Figure 3B is from the amplitude from the titrations performed in Figure 3A; however, a larger number of titrations were performed than are represented in 3A in order to prevent 3A from being overcrowded. In other words, the fold-increases in Figure 3B were determined from a full stoichiometric titration where each titration was completely and fully saturated. 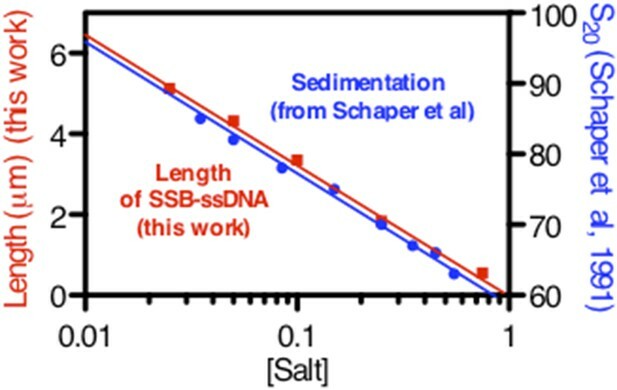 We also performed a “salt back--titration”, where complexes were formed in the absence of salt, and salt was increased in order to determine the concentration at which SSBf fully dissociated from ssDNA. This data is now included as a Figure 3–figure supplement 1. We had already mentioned this in the subsection “The extent of intramolecular condensation of SSB-coated ssDNA exceeds expectations based on simple wrapping or binding-mode transitions”, third paragraph. There, we articulated our caveat that the greater than expected condensation at high [NaOAc] could be due to dissociation of SSBf and formation of secondary structure. Nonetheless, we have tried to more accurately articulate this possibility throughout the manuscript. We have updated the legend to the “purple and gray striped area” instead of the “gray area” and clarified the description. We have taken the reviewers’ recommendations and we have shortened and edited this discussion accordingly. We have added these references, and have included this possibility to the Discussion. We are grateful to members of the laboratory for their comments on this work. JCB. was funded by the UCD-NIH Pre-doctoral Training Program in Molecular & Cellular Biology (T32 GM007377) and SCK was supported by the National Institutes of Health (GM-62653 and GM-64745). © 2015, Bell et al.